You can make a donation through PayPal or by sending a wire transfer. This is to an NGO supported by painter/artist Maestro Francisco Toledo, and we got this information through his organizations. Many of you have asked. This is an important way you can help. This entry was posted in Oaxaca Mexico art and culture and tagged donations, earthquake, Oaxaca. Bookmark the permalink. Are you still accepting donations? Please write directly to the project coordinator, anthropologist Denise Lechner at lechner.denise@gmail.com I am certain she is accepting donations via PayPal. 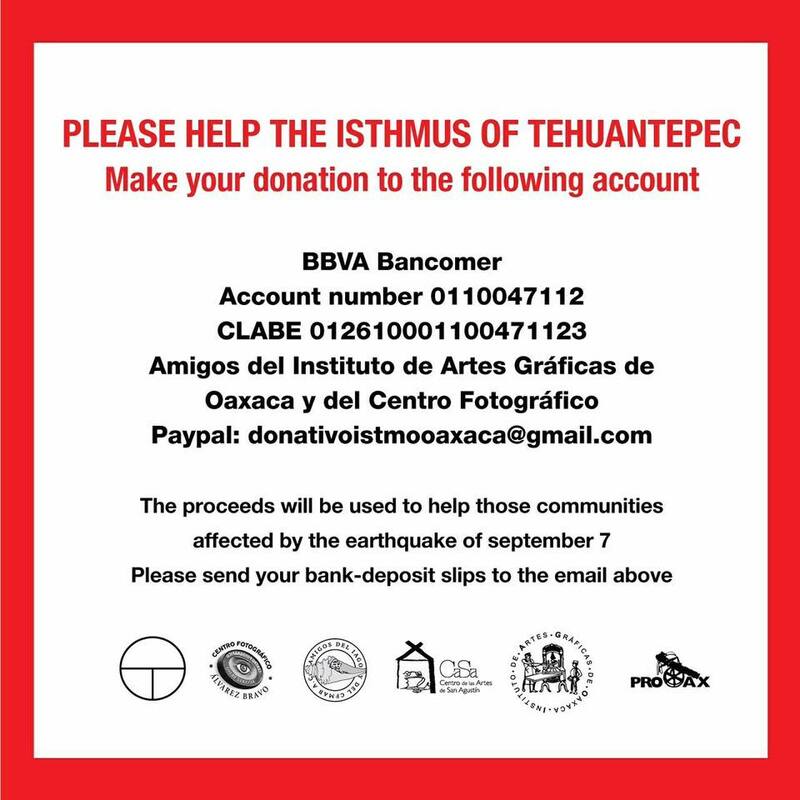 Hi Norma, I’ve tried to support the IAGO several ways (through their paypal.com/donativoistmo link and direct to ‘donativoistmooaxaca@gmail.com’) but neither are accepting payments. The donation to Denise has gone through. Please let me know if you have a method that works… Thanks! I want to send some help to the people of Juchitán. find any links! My Mexican bank does not recognise the name of the Bancomer account. What can I do? Hamish, see my reply to Daniel. It is for you, too! Yes, this is a very good way to donate and help our beloved Oaxaca friends. The renowned and respected artist, Francisco Toledo, can be trusted to make sure that the funds reach the people in their need. Also, the Red Cross is actively coordinating the Help Centers (donations and medical help) around Mexico, especially in Mexico City, which are receiving food donations. I began volunteering for the Red Cross when I was 10 years old in Colima and I am glad to be of help still. Please bring food/medicine donations to the Red Cross if you are in Mexico. You probably don’t remember me but we met on the flight to Oaxaca in 2011 when I was taking friends to Dia de los Muertos. I wonder if I could send you a donation for the earthquake relief via Paypal and have you send it on? I’d rather not sign up for the intl system myself if you would be doing it as well. I visited Tehuantepec last week and connected with lovely people in the bus on the way there. I cut my visit short, returning to Oaxaca City early and missed being on the epicenter by one day. I think of the people I talked to on the bus who continued to Juchitán and pray that they are okay. Making my donation now. Thank you, Norma for posting this and all your posts. Thank you for your generosity, Laurel. Blessings!